Southeastern Connecticut sailor Prescott Littlefield will lead a team of Mystic River Mudhead Sailing Association sailors in the Hospice Regattas National Championship, which will be held April 28 – May 1 in Galveston, TX. Littlefield’s crew includes Claudia Koerting, Matt Wilson, Liz Sistare and Matthew Littlefield. Prescott Littlefield will lead a team of Mudheads (pictured aboard his J/29 Zig Zag Zoom) at the Hospice Regattas National Championship. Littlefield has raced his J/29 Zig Zag Zoom in the Mudhead Donzo Wednesday Night Race Series and countless other Eastern Connecticut Sailing Association regattas for the past decade. He has also been an active frostbite racer in Essex (Frostbite YC) for over 20 years in a JY-15, and more recently, in a Laser. He is the Waterfront Programs Manager at the University of Connecticut Avery Point campus and a sailing coach for the Avery Point Sailing Club and The Williams School Varsity Sailing Team. The regatta venue, Sea Scout Base Galveston, offers reliably outstanding sailing conditions and a racecourse that’s “steps away in the front yard.” Competitors will race Sonars in a round-robin series that will maximize time on the water for all teams. The Hospice Regattas National Championship was the first U.S. charity sailing championship to promote local regattas’ efforts to support hospice programs. The event offers three days of sailboat racing for one winning skipper and crew from each local hospice regatta that has completed at least two regattas. For more information, visit hospiceregattas.org. The National Hospice Regatta Alliance is a non-profit, 501(c)(3) association of hospice regattas that independently raises money and awareness for hospices in their communities. It supports a rapidly expanding nationwide network of regattas that publicize hospice care — from the East to the West Coast, from the Great Lakes to Florida. NHRA is an all-volunteer organization helping hospice regattas grow and learn from each other, and promoting hospice care nationally. Since the first Hospice Regatta in 1982, more than 20,000 sailors, sponsors and volunteers have raised more than $12 million to provide hospice care to terminal patients and their families without regard for ability to pay. Locally, the Mudheads work with Center for Hospice Care, a community based, non-profit organization serving Eastern Connecticut since 1985. It provides end-of-life care to over 700 patients and their families each year regardless of age, disease or ability to pay. In addition, more than 1,500 friends and family members receive bereavement support free of charge regardless of whether their loved one’s death occurred under hospice care, and special programs like Expressive Arts for children, teens and adults help the bereaved cope with their loss in a non-threatening and creative environment. Local sailors have raised money through the Center for Hospice Care Regatta Series for over 26 years. This year’s Mudhead Benefit Regatta is July 16. For further information, visit mudhead.org. 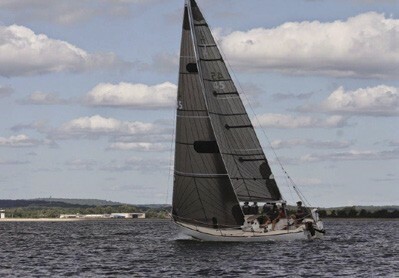 For over 25 years, sailors in southeast Connecticut have raced to raise funds and awareness for Center for Hospice Care. More than 700 sailors and friends participate in this annual race and party series. Questions may be addressed to Jennifer Wheelehon, Development Manager, at jwheelehon@hospicesect.org. To register your boat, support a crew, or learn more about becoming a sponsor, visit hospicesect.org/events/what/regatta-series. Courtney Moore is a longtime Mudhead, and her Baltic 39 Patriot is a perennial contender in the Mudhead Benefit Cup for the Center for Hospice Care.